This morning I spent some time fluffing the dining room decor. It had been the resting spot for all the everyday decor I pulled out of the closet after Christmas. It was easy just to walk in here and look at what was on the table rather then running back and fourth to our master bath. I love this print! I have had it printed out and ready to frame for awhile now but just never got around to it. Took the plates out of the larger herb crate and brought out the smallest herb crate to hold the antique silverware. I also brought back out my favorite bust form and crazy bird nest wreath thingy that I purchased at HomeGoods about two years ago. I love the little round frame but have yet decided what to put in it. Here it is all put together. The large whit mirror came back into play. It had been waiting patiently in the hallway. Now the Eagle mirror and shutters are in the hall way. Not sure if the cute artichoke votive holders will be staying or not. I had purchased them last week yes again at HomeGoods. I swear they should start paying me to shop there! :) What I really wish is that they would start a frequent shopper program or have coupons!! Now that would rock! Anyways, here is another teaser of Antoinette! She is almost ready for her full debut. I just have three drawers left to wax and then to finish the other side of her. Your buffet looks great, Pamela! I like this look! That is a beautiful print and I'm glad you found a frame for it. Antoinette is looking wonderful ~ I can't wait to see her in all her glory! Gorgeous room, I feel inspired to get up off the couch and decorate! Beautiful layering! I love to move things from room to room. Can create a whole new look right from your own house! Pam.. I have the same white dishes and wooden parsley box and I would have never thought to put them together like you did. Everything is gorgeous. Ok I have to ask where did you find that gorgeous mirror? She is a beauty!! Great Fluffing as always!!! Your dining room fluffing is inspiring! Thanks for sharing your HomeGoods finds! So gorgeous. 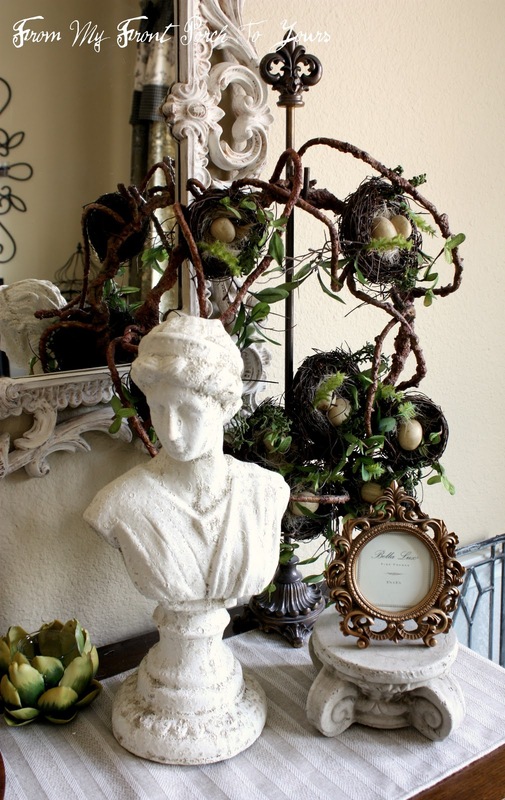 Love the bust and crazy birds nest thing. You sure know how to fluff girl. I've got to get off my couch and start, thanks for inspiring me! thanks for sharing you creative inspiration at Sunday's Best! A lovely vignette, Pam. And Antoinette is so pretty! It looks great Pam, love that print and all your fluffing! Can't wait for reveal of Antoinette!